The sound of a violin is the result of interactions between its many parts. Drawing a bow across the strings causes the strings to vibrate. This vibration is transmitted through the bridge and sound post to the body of the violin, which allows the sound to effectively radiate into the surrounding air. The tension and type of strings, placement and tension of the sound post, quality of the bow, and the construction of the body, all contribute to the loudness and tonal quality of the sound. The strings of a violin are stretched across the bridge and nut of the violin so that the ends are essentially stationary, allowing for the creation of standing waves. The fundamental frequency and harmonic overtones of the resulting sound depend on the material properties of the string, such as the tension, length, mass, elasticity and damping factor. String tension affects the sound a violin produces in an obvious way. Increasing the tension on a string results in a higher frequency note. The strings of a violin are wrapped around adjustable tuning pegs. By turning its associated peg, each string may be loosened or tightened until it produces the desired pitch, which may be described in terms of frequency. The playing tension of a violin string ranges from about 9 lbf (40 N) to 20 lbf (89 N). The length of the string also influences its pitch, and is the basis for how a violin is played. Violinists "stop" a string with a left-hand fingertip, shortening its playing length. Most often the string is stopped against the violin's fingerboard, but in some cases fingertip contact alone is enough to stop the string at the desired sounding length. Stopping the string at a shorter length has the effect of raising its pitch. String material affects the quality of the sound. A vibrating string does not produce a single frequency. The sound may be described as a combination of a fundamental frequency and overtones, which form the sound's timbre. String material influences the overtone mix. Response and ease of articulation are also affected by choice of string materials. Violin strings were originally made from catgut which is still available, although its market niche is limited, due to its cost and tuning sensitivity to humidity and temperature. Modern strings are made of steel, stranded steel, or a variety of synthetic materials. Violin strings, with the exception of most E strings and some "historically informed" gut strings, are wound (or overspun) with metal to keep their thickness within comfortable limits as well as to manage their surface friction properties. Some stranded steel strings have an inner winding under the surface winding. The bridge supports one end of the strings' playing length. It must stand up under a combined down force of about 20 lbf (89 N). Down force preloads the violin's top, or table, affecting the sound of a sensitive instrument. String break angle across the bridge affects the down force, and is typically 158°. More importantly, the bridge transfers vibration from the strings to the top of the violin. The most significant bridge motion is side-to-side rocking, coming from the transverse component of the strings' vibration. The bridge may be usefully viewed as a mechanical filter, or an arrangement of masses and "springs" that filters and shapes the timbre of the sound. 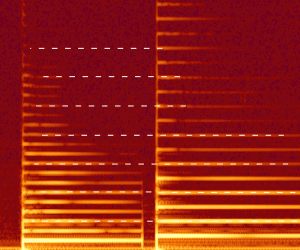 Often the bridge is shaped to emphasize the singers' formant at about 3000 Hz. Excitation of string vibration is generally provided by a bow consisting of a flat ribbon of parallel horse hairs stretched between the ends of a stick, which may be made of wood or synthetic material such as fiberglass or carbon-fiber composite. The length, weight, and balance point of modern bows are standardized. Players may notice variations in sound and handling from bow to bow, based on these parameters as well as stiffness and moment of inertia. The hair is coated with rosin to provide controlled stick-slip as it moves transversely to the string. Different types of rosin are available, providing varying amounts of "grip" or static friction. In bowing, the three most prominent factors under the player's immediate control are bow speed, downward force, and location of the sounding point where hair crosses string. The desired sounding point will generally move closer to the bridge as the string is stopped to a shorter sounding length. The player may also vary the amount of hair in contact with the string by tilting the bow stick more or less away from the bridge. Violinists are trained to keep the bow perpendicular to the string in most cases, as other angles may adversely affect the sound. The body of a violin must be strong enough to support the tension from the strings, but also light and thin enough to vibrate properly. The body of a violin consists of two arched wooden plates as top and bottom of a box, whose sides are formed by thin curved wooden "ribs." The ribs are reinforced at their edges with lining strips, which provide extra gluing surface where the plates are attached. Animal hide glue is used to fasten the parts together, since it is capable of making tightly fitted joints which do not damp vibrations nor add reflective discontinuities to the vibrating structure. An internal sound post helps transmit sound to the back of the violin and serves as structural support. The body of the violin acts as a "sound box" to couple the vibration of strings to the surrounding air, making it audible. The construction of this sound box, and especially the arching of the top and back, have a profound effect on the overall sound quality of the instrument. The sound-producing system of the violin body includes the top and back (and to some degree the sides, or ribs), the bass bar that is glued to the underside of the top, and the bridge and sound post. In addition to the resonant modes of the body structure, the enclosed air volume exhibits Helmholtz resonance modes. ↑ "D'Addario Violin String Tension Chart (PDF)" (PDF). Path Through the Woods - The Use of Medical Imaging in Examining Historical Instruments The use of computer aided tomography (CT Scanning) to examine great Italian instruments in order to replicate their acoustics in modern instruments.